Does The Cloverfield Sequel Hit The Mark? The long-awaited Cloverfield sequel delivers on the hype, but it's not the follow-up you were expecting. Like an out-of-the-blue Beyonce album drop, 10 Cloverfield Lane arrived unawares earlier this year thanks to a trailer piggy-backing on Michael Bay’s war drama 13 Hours. It’s a stealth tactic producer JJ Abrams used eight years ago to launch the original Cloverfield. In an age when every major blockbuster release is dissected at length online months before release, here was a film that somehow managed to retain the element of surprise. Fans have been clamouring for a Cloverfield sequel for years, and though this is only a tangentially related off-shoot, its spirit lives on in director Dan Trachtenberg’s film. The name Cloverfield here refers to an address rather than a government case file for a monster attack, but like an over-arching Twilight Zone-style episode, there are common threads that pull this into the “Clover-verse”. Trachtenberg ditches the original’s queasy found footage camerawork for a more conventional approach. His film follows Michelle (Mary Elizabeth Winstead) as she drives off into the night after splitting with her fiance. She’s run off the road, then finds herself chained up in a bunker as a prisoner of John Goodman’s Howard – a survivalist convinced the world outside has ended. With him is redneck Emmet (John Gallagher Jr), who helped build the bunker then took shelter inside. Ostensibly a three-hander, 10 Cloverfield Lane’s most terrifying monster isn’t a digital creation, it’s Howard. Goodman delivers a creepy, sinister performance that’s counter to anything we’ve seen him do before. Things get unbearably tense when Michelle and Emmet put him under the spotlight – push him too far and he’s prone to simmer then explode. Is the outside air really contaminated? How long will they have to stay down there? And is there any truth to the yarns Howard’s spinning about his supposed daughter? These questions hang in the air, but eventually a kind of normality sets in for the trio; board games, jigsaw puzzles, firing up I Think We’re Alone Now on the jukebox, watching cult VHS horror films. However, the tight enclosed spaces of the bunker can’t hide all Howard’s secrets, and character dynamics flip to bring Michelle to the fore. This underground psychological thriller dramatically shifts gears into more obvious Cloverfield territory, and Winstead transforms from victim into a Sigourney Weaver-style action badass. The sudden genre switch-up may leave some viewers scratching their heads, but it’s in keeping with the type of Spielberg-inflected sci-fi Abrams’ Bad Robot company served up in Cloverfield and Super 8. You think you’re watching a low-budget horror, then suddenly the rug gets pulled, the scope widens and the film becomes something else entirely. 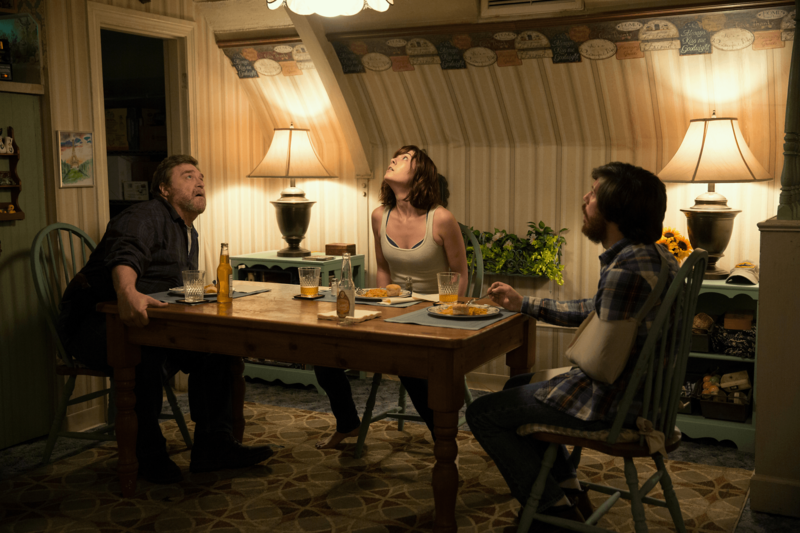 Nail-bitingly tense, packed with twists and well-worked shocks, and bolstered by outstanding performances from Goodman and Winstead, 10 Cloverfield Lane sticks down an inventive and impressive early marker for blockbuster season. Just make sure to avoid all the trailers – the less you know about this, the better it’ll be.